Home / Round-Up / 03/03/2016 – ArsenalShorts. Round-Up June 1, 2016 , by Ian H.
With Arsenal (ahem…) hot on the heels of their first EPL title in more than 11 years, it seems as though Arsene Wenger’s tenure will come full circle by the end of the 2015/16 season. Despite the form of Manchester City and surprise league leaders Leicester, the Gunners seem well-placed to claim just their fourth league title under the stewardship of Wenger. In truth, this should come as a surprise. After all, Arsenal have claimed two FA Cup successes in the last two years, while also continuing to gain experience and add world class players such as Mesut Ozil and the mercurial Alexis Sanchez to their squad. If this year goes according to plan, they may even be celebrating a league and cup double by the time this summer’s Euros come around. While this may seem a strange selection, we can assure you that it has only made the cut on the basis of its artistic value alone. This away kit remains the Gunners’ only green kit to date, while the accompanying navy blue sleeves make for a stylish and distinctive look befitting of Arsenal’s stature and heritage as a football club. It only lasted the course for a single season, however, most likely because the Gunners finished in 10th place in the top flight in 1983 and lost 12 of their 21 league games on the road. At the end of the 2005-06 season, Arsenal moved from their iconic Highbury Stadium and into the wide open spaces of the Emirates. To commemorate this immense occasion, the Gunners adopted a special kit that replicated the colours and style worn by the Woolwich Arsenal side of the early 20th century. Displaying a bold claret shade as opposed to the classic red and white, the Gunners wore this now-iconic strip for a single year before making the move to a new home and returning to their traditional colours. 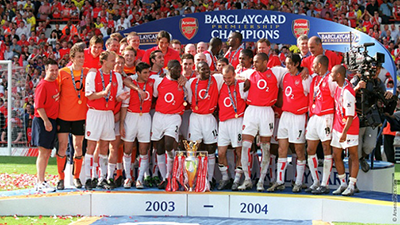 We now come to the seminal Arsenal home shirt, as worn by the legendary ‘Invincibles’ side of the 2003 /04 season. Featuring the classic red body and striking white trim, this kit was worn for every home game during the 2003/04 season as the Gunners became the first side since the late 1880’s to go through an entire, top flight English League campaign unbeaten. Winning 26 of their 38 league games and drawing the other 12, the club finished 11 points clear of Chelsea in second place while the kit became renowned as one of the most imposing and memorable of all time! « Previous Article 25/05/2016 - ArsenalShorts. Next Article » 07/06/2016 - ArsenalShorts.